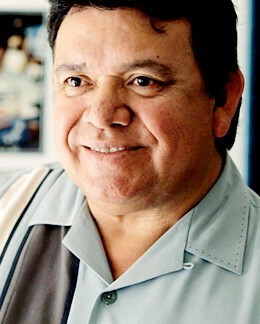 Fernando Valenzuela was born November 1, 1960 in Etchohuaquila, Sonora, Mexico and is a former left-handed pitcher who pitched for six different teams during his Major League Baseball career, most notably the Los Angeles Dodgers, with whom he pitched for eleven seasons, from 1980 to 1990. Thanks in part to his Ruthian physique, and a devastating screwball that helped him win his first eight straight decisions in 1981, Valenzuela touched off an early 80s craze dubbed Fernandomania. That year, Valenzuela became the only player in Major League history to win both the Rookie of The Year award and the Cy Young Award in the same season. Valenzuela's efforts made him the odds-on favorite to be the league's top rookie in 1981, and he didn't disappoint, starting the season 8-0 with five shutouts and an ERA of 0.50. Punctuating this dominance on the mound, Valenzuela had an extremely unusual but flamboyant wind-up (looking skyward just at the apex of every pitch), which drew attention of its own. It was a habit which he claims to have developed spontaneously, although not until joining the Dodgers. He became an instant media icon, drawing huge crowds from the Los Angeles Hispanic community every time he pitched and triggering high demand across the country for his rookie baseball cards. The craze surrounding Valenzuela came to be known as Fernandomania. Valenzuela was less dominant after the 1981 player strike wiped out the middle third of the season, but the left-hander still finished with a 13-7 record, a 2.48 ERA, and a league-leading 180 strikeouts. That season Fernando Valenzuela became the only pitcher to win Rookie of the Year and Cy Young Award honors in the same year. In the post-season, Valenzuela pitched a complete Game 3 of the 1981 World Series against the New York Yankees, helping the Dodgers to their first World Championship since 1965. In addition to his skills on the mound, Valenzuela also made a name for himself at the plate. During his rookie season, Valenzuela batted .250 and struck out just nine times in 64 at bats. That season, and again in 1983, Valenzuela was the recipient of the National League's Silver Slugger Award for pitchers. In 1990, his last season with the Los Angeles Dodgers, Valenzuela hit .304 in 69 at-bats, with one home run, five doubles, and eleven runs batted in. In 936 career at-bats - roughly two full seasons worth of at-bats for a full-time position player - Valenzuela had ten home runs and 84 runs batted in. On at least two occasions with the Dodgers, Valenzuela was called upon to play outfield and first base in marathon extra-inning games in which he did not pitch. Popular baseball players such as a Fernando Venezuela have made the national past time what it is today. The booking agents at AthletePromotions can assist with Fernando Venezuela appearances or speaking engagements from current and retired legends. We have years of experience in booking the boys of summer for autograph signings as well as keynote speeches. Booking a baseball speaker like Fernando Venezuela is not a hard process. Our agents can provide availability, fees and all costs associated in bringing out a successful football star to your next corporate event. Our team will find Fernando Venezuelas agent to make this booking happen. A Fernando Venezuela appearance will add energy to your upcoming event and reward employees, customers and clients. Most likely, baseball fans and corporations can find Fernando Venezuela's official website, charity involvement, Twitter account, representation, publicist and management info at www.Fernando Venezuela.com.